The name of my blog is Savour Food Savour Life. I believe one of the best ways to savour both food and life is via travel. Travel affords the time to slow down and actually savour your surroundings, your food and consequently, your life. Incidentally, travel has also been shown to stimulate the brain and cause increased neuroplasticity and cognitive reserve. These two things are crucially important in optimal brain function as we age. In my previous life as a nurse I saw countless people never get a chance to experience travel due to unforseen tragedy or circumstances. Early in my life I adopted the motto: “go while the going is good”. I tend to approach life this way and its amazing how many like-minded people I meet. My friends Kath and Megan are two great examples. Kath and Megan both take their food and travel seriously. Mostly, they have serious fun while exploring both. 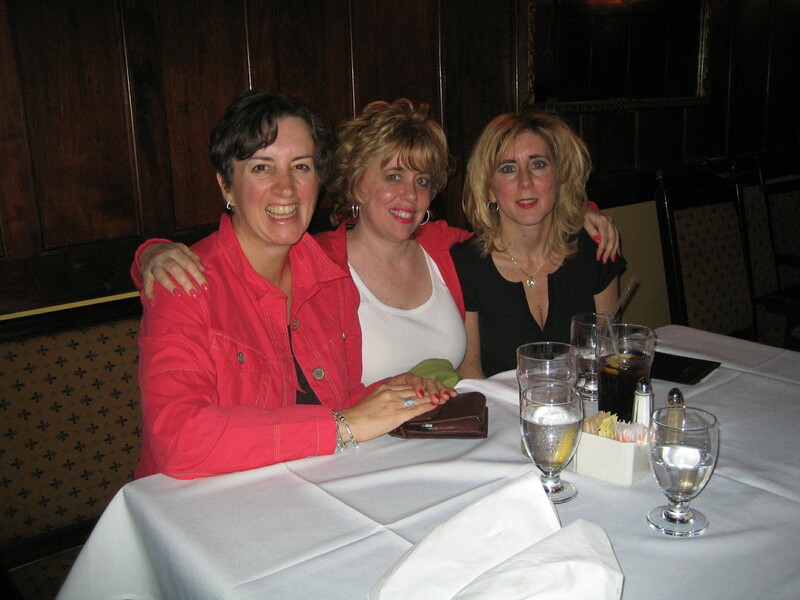 When I heard they were both travelling to The Big Apple this last spring and summer I thought it would be fun to hook them up so they could compare notes and tips with each other. Turns out they had such good notes and tips, I thought you might enjoy them too. They both agreed it would be fun to let their findings flow to a wider audience, so I’ll be acting as the conduit. Kath went first. She’s a Brit ex-pat, now living in Calgary. She was heading to NYC for a reunion with a group of old friends from the UK. The gang’s express purpose was visiting and eating their way through NYC. When you read her notes which follow, you’ll see why I have since “cherry-picked” her to work for me at www.calgaryfoodtours.com She’s got an excellent palate and pays great attention to details. Just what we love at Calgary Food Tours. The Big Apple. Even the name hints at New York City’s massive potential for culinary delights. But, since there are over 20,000 restaurants to choose from, knowing where to eat can be a little overwhelming. Because tourists have relatively little time to explore it can be a real let down when one of your hopeful hits turns out to be a miss. In the past we’ve tried the well-known delis and eating institutions such as Carnegie’s Deli www.carnegiedeli.com and Katz’s Delicatessen http://katzsdelicatessen.com and though touristy they are enjoyable. In fact now, no trip to NYC would now be complete without popping in to sample the sizable smoked meat sandwiches or famous New York Cheesecake, but on this trip my friends and I wanted to dig deeper into the food scene to answer the question, where do the locals eat? Locals haunt local haunts for a reason. They’ve already ruled out the touristy and over-rated spots, they’re more in touch with the pulse of the restaurant scene and in tune with what warrants the current buzz. We made a pact to chat up concierges, people on the street, wait staff and to sniff out some of the lesser known gems on offer to the city’s residents. What follows are our top findings. A meal is never over without a little something sweet to complete. Here are a couple of special places that we found. Note: if you are interested in NYC’s food truck culture visit the New York Food Truck Association’s website: www.nycfoodtrucks.org There are currently 39 gourmet trucks circulating the city. 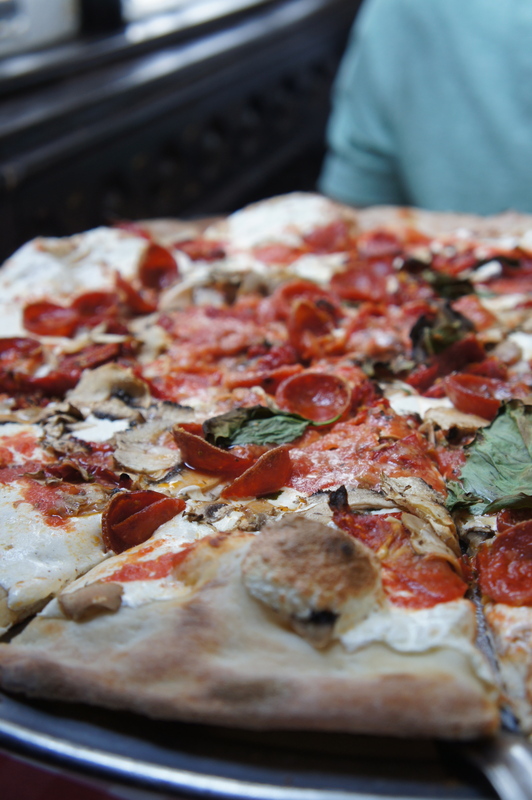 With its noticeable Italian influence, we thought a trip to NYC wouldn’t be complete without sampling some of what’s been called the world’s finest pizza and pasta. We wanted to know if that was a proud NYC boast or something we could verify. Now onto Megan’s recommendations. Megan is the daughter of my dear friends Tony and Penny Marshall of www.highwoodcrossing.com She and her sister Kerry signed on early this year to come on a cuisine and culture trip to Kerala, India in a few weeks so I already knew she was an adventurous eater. Her parents are wonderful cooks and she grew up eating an amazing diet of local produce and grains long before it was de rigueur. Stanton Social – http://thestantonsocial.com This was a recommendation from a friend and we loved it. We had “Brooklyn Lemonade” cocktails at the bar upstairs and then headed downstairs for dinner. The menu is all little sharing plates and we loved that this allowed us to try a bunch of different things. We went for the sliders, chicken waffles and red snapper fish tacos. It has a very cool vibe and was buzzing with the lively conversations of families and friends at surrounding tables. Grimaldi’s – http://www.grimaldis.com Katherine was right, this pizza shop is worth going to for the atmosphere alone. They have tasty, HUGE pizzas. We went right when it opened for lunch and were the first in line (Great tip Megan). By the time we left there was a line up around the block along with a red rope and pizza ‘bouncer’ keeping guard/taking names. We planned it so we’d eat and then walk back across the Brooklyn Bridge and we were definitely well fuelled for the journey. Buddakan – http://www.buddakannyc.com This place had great food and a hip “see and be seen” atmosphere which made it feel like more a club than a restaurant. Their menu is contemporary and had a lot of interesting fusions. We tried the lots of dumplings – edamame, pork, carrot, and shrimp and while they are all classics each delivered a surprising twist of successful fusion. 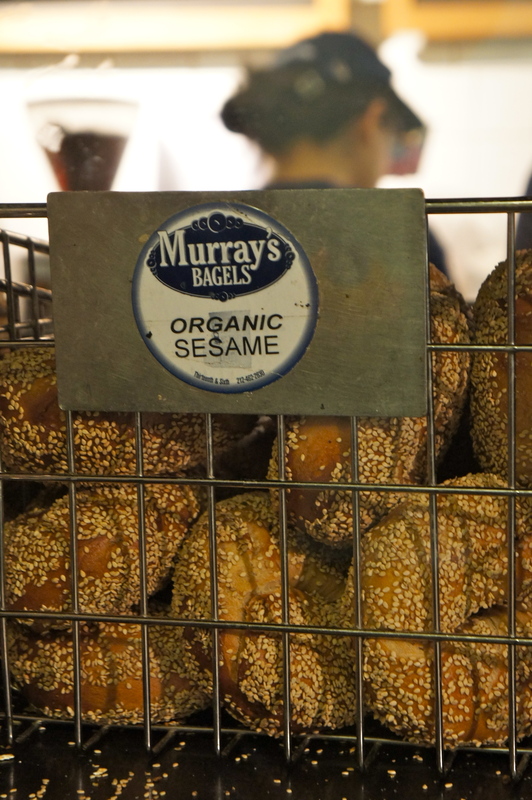 Murray’s Bagels – http://murraysbagels.com/mobile/home.htmI I did lots of research on the best bagel joints. I love a great bagel. It seemed like H&H, Murrays and Absolute bagels were the top ones. We happened to be closer to Murray’s and it didn’t disappoint. A word to the wise: Don’t be that girl in the line who can’t decide what she wants. The staff don’t tolerate indecisiveness well in their constantly jam-packed joint. It’s quite the authentic New York experience. Bourgeois Pig – http://www.bourgeoispigny.com This is a good place for chocolate fondue after dinner….or wine and cheese fondue for your actual dinner! We had the roasted wild mushroom fondue – and plenty of their white, rose and red sangria. Yum. High tea at the Plaza – http://www.fairmont.com/theplaza/GuestServices/Restaurants/AfternoonTea.htm This was a memorable experience right on Central Park. Tea, little sandwiches, scones and lots of treats. 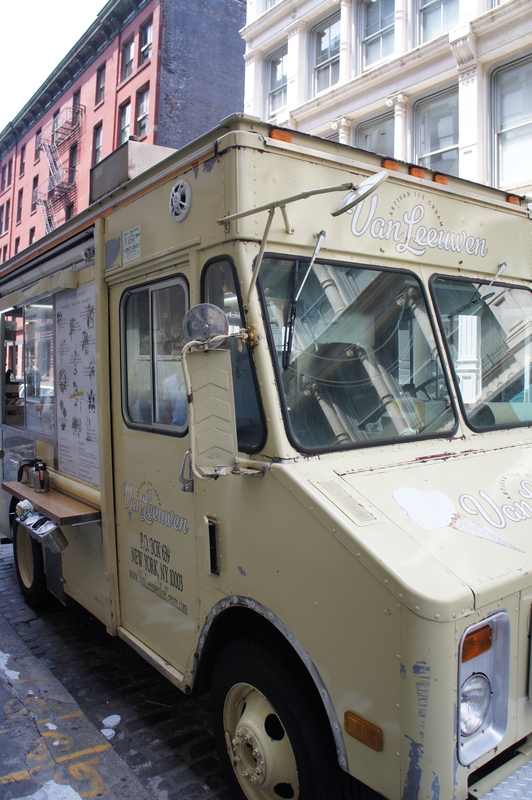 Van Leeuwen Ice Cream – http://www.vanleeuwenicecream.com/new Another of Katherine’s great suggestions which we enjoyed for a snack. We had pistachio from a food truck in SoHo. Devi – http://www.devinyc.com/home.html This was a great suggestion from Karen (I chipped this suggestion in because Megan was looking for Indian food but can’t take full credit. I had just had a conversation with my friend Raju Banerjee of www.industravels.com and she told me this is her favourite Indian restaurant in NYC. Her son lives in Manhattan and every time she visits they eat there – quite a commendation indeed) Best chicken tikki malasa I’ve ever had. Manchurian Cauliflower and samosas were also delish. Sarahbeth’s – http://www.sarabeth.com/ • This was an “Oprah recommendation”. We went to the location off central park for brunch. They’re known for their preserves and scones which were unfortunately all sold out when we arrived. They did have great overall brunch fare though (me again – Megan is being too nice here. I’d be bitter as I love scones and if a place is known for their scones and ran out of them by the time I got there (still brunch time) I’d be sad and disappointed. What gives Sarahbeth? Make enough scones already). Babycakes – http://www.babycakesnyc.com I’m not a vegan or celiac but friend’s with allergies highly recommended this place and their cookbook. They were very good cupcakes for alternative flour baking. I’m embarrassed to admit that I lived in Boston for three years and only made it to NYC once. I went to visit my high school best friend whose been living in Brooklyn since college graduation. We mostly hung out and visited with her family as her children were quite young then but one night we went for dinner at a most mysterious place indeed. She said, we’re going to Peta Luca. There’s no menu, you’ll love it. All I remember is us all piling into her mother’s old “woody station wagon” and driving to what I thought was a rough neighbourhood on a cold dark winter night. Her Mom paid someone to watch the car. I was impressed. We went upstairs, were tucked in at long communal tables and Eileen ordered, “Tomato and onion salad, cream spinach, potato scallop, steaks and red wine”. The tomatoes and onions tasted like they’d been kissed by Sicilian sun the day before. the creamed spinach and potatoes were bland, cream laden and obviously designed to let the real star of the show shine. Enter the mammoth porterhouse steaks from the early Flinstonian era. I’ve never forgotten them. Flash forward 10 years. My husband has a “flashy” 4 day meeting in Manhattan. He’s had this board meeting for a few years now and says the work is winding down and this will be the last time the group meets so, why don’t I come along and have a reunion with Eileen? I phone Eileen with the news and the first words out of her mouth are “Eddie, get on the phone to Peta Luca, we’ve gotta take Karen and her husband!” They got a reservation for 9pm calling three months in advance. That’s fine I say, Todd and I don’t mind. Eileen says, no, Eddie does not eat at 9pm. Meet us there at 7pm. We’ll get in. Meanwhile, we arrive and have a little time between Todd’s meetings to explore the city. I’d recommend walking everywhere. Manhattan is clean and friendly and caring in a post 9-11 world. We went to The Met and then strolled across Central Park to The Museum of Natural History to pick up a gift for our son. 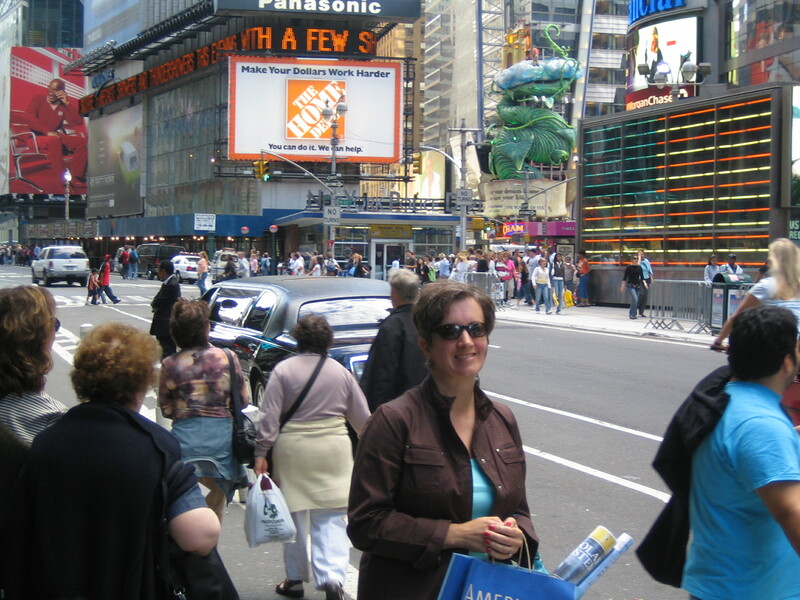 We took the subway down to the Theatre district to grab a quick bite and after our show we walked the whole way back to The Carlisle where we were staying. Of course there’s no end to the shopping that can be done and I met Eileen and her sister Theresa for lunch and some serious retail therapy at Macy’s and Saks and then I forced my two non-cookery friends to take me to www.deananddeluca.com Eileen had to call Eddie and say, Karen wants to go to a grocery store, can you believe it? She had to ask him where it was, despite the fact that people all over the world make pilgrimages to what was one of the first great importers of fine cheeses and food goods. 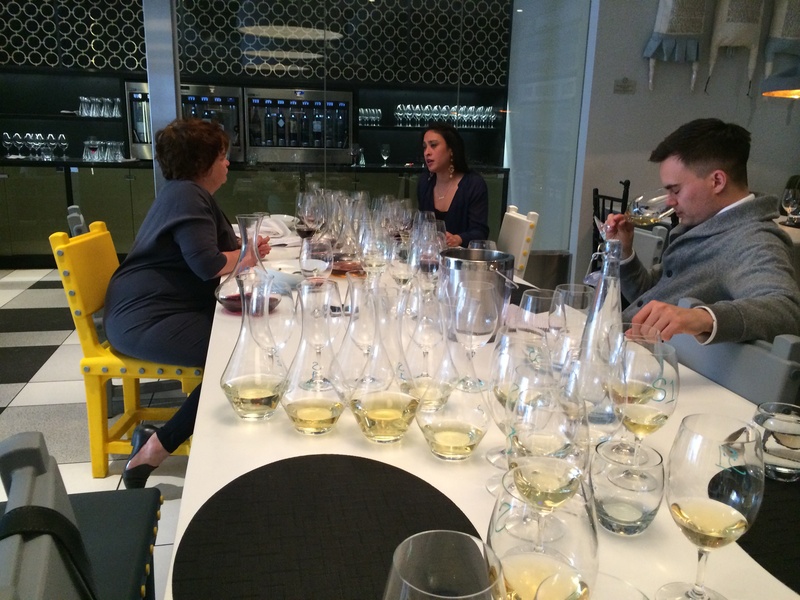 The few days zipped by and the night arrived when we were to meet our friends at Peta Luca. I’ve met Eddie a few times. He’s born and raised in Brooklyn, fighting Irish descent, and a veteran firefighter who survived building two falling on him in 9-11. I know he’s an absolute marshmallow with his kids and Eileen but that he also likes to talk trash when he plays basketball and put on the tough act to get him through his incredibly demanding job. Eddie and Todd have never met. Eddie has told me more than once that he can size up someone’s character in 3 minutes and he’s going to give me a quiet thumbs up or down to let me know what he thinks of my husband. I know he’s just pulling my leg but nevertheless, my tip to Todd is order what Eddie orders and what every happens, go with it! So, there you have it. 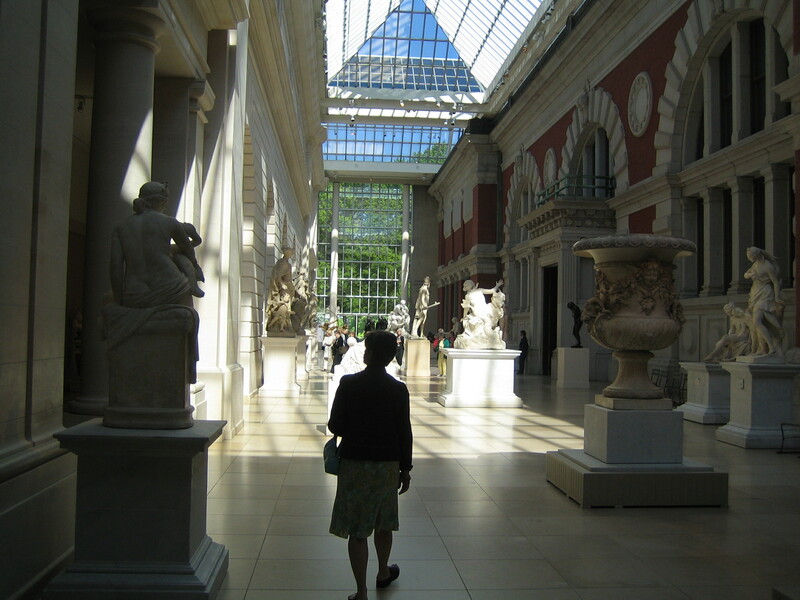 Two brief accounts from Kath and Megan of what they enjoyed in the spring and summer of 2012 in NYC and my rather long and rambling story of a little exploring, a little shopping and theatre and a ten-year time warp between two great visits to the famous Peter Luger Steakhouse. I’m sure whatever cuisine you are looking for, you will find it in New York City. Let us know what you think of our suggestions and please feel free to add to our list with any of your own recommendations in the comments section.